Henderson County Schools, in partnership with the Preston Arts Center, will host Photo Ark Family Nights. 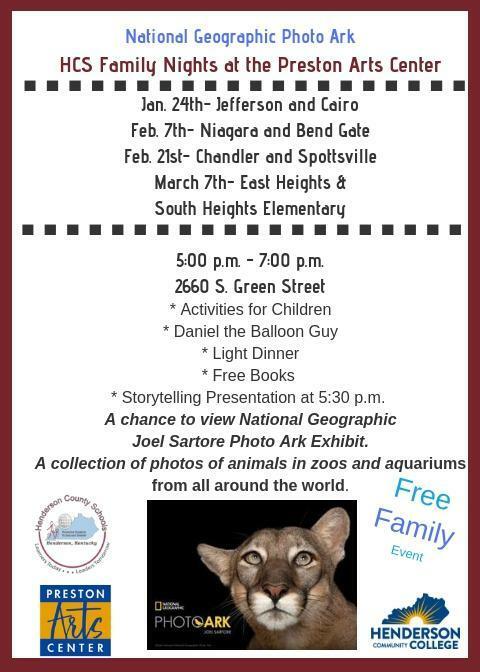 Henderson County Schools, in partnership with the Preston Arts Center, will host Photo Ark Family Nights starting on Thursday, January 24th. Photo Ark is a multi-year National Geographic project with a simple goal—to create portraits of the world’s species before they disappear and to inspire people to care. Each image is a visual connection between the animals and people who can help protect them. Photo Ark Family nights will include the opportunity for families to view the National Geographic exhibit that has traveled across the world and is now on display in Henderson at the Preston Arts Center through March 15th. The Henderson County Schools Family Nights will also include a stage performance, book giveaways, activities, Daniel the Balloon Guy, and dinner. The event starts at 5:00 p.m. is free for families to attend on their designated school night. In addition, Field Trips to the exhibit are scheduled for elementary, middle school, and high school classes.